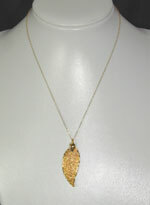 Like the silver leaf pendant this necklace is plain but this helps the eye to focus on the beautiful gold covered evergreen leaf. If you like the idea of skeleton leaves but more robust this necklace is perfect for you.This real evergreen leaf has been coated in 24k gold but shows fine detail. The pendant hangs from a 16" gold filled(hard wearing) delicate chain making this necklace ideal for this seasons metallic trend.